Last Friday I think I hit my waiting threshold. I waited patiently for a few minutes until I realized that our scheduled babysitter was not coming, and then I loaded up Little Sprout and prepared for a trip to work with her as an unscheduled guest. I waited for my computer to logon…and eventually realized that it was helplessly broken. I waited for the computer techie people to come save my laptop…this waiting included occupying Little Sprout with the few gadgets I have in my office, and we waited, and waited and waited for three hours until it was time to leave to meet the other sprouts coming home from school, and I simply closed up my laptop and took it home broken. I dusted off our desktop and realized that I had not waited that long for a computer to boot in years. I spent the weekend waiting for webpages to load and the letters that I typed to slowly appear on the screen. I am done waiting. It is truly wasted energy. I’m ready to let this one go. Waiting makes me angry. It is an act that I do when I am not happy to be where I am doing what I am, and I am impatient to get to somewhere else. In past years, I have spent the days during my husbands’ absence waiting for him to come home. I haven’t really done that this year. I have chosen living over waiting, and you know what…time goes by much faster! So please call me on it, if you hear that I have waited for anything. Instead of waiting for the techies to come save me…I pushed Little Sprout in a rolling office chair and she and I pretended we were traveling to the moon. Instead of waiting for the computer to fire up, I made coffee or wrote notes or refereed squabbling children. Waiting in traffic will become…rocking out with chair dancing and concert-style singing. If there isn’t any good music on I’ll just pump my fist to get truckers to honk or make up stories about the people in the cars around me. Waiting in line at the post office or the grocery store will be devoted to conversations with my fellow waiters and if they don’t want to talk, I’ll just make up stories about the plans they have based on the packages they carry or the food they are planning to buy. 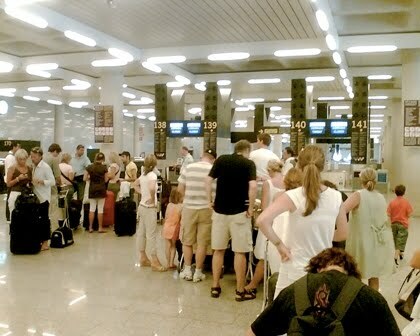 Waiting in the waiting room or in lines at the airport or for luggage to arrive need to be about more than waiting. It takes energy to be creative in these settings, and it is easy to be sucked into the “waiting” malaise, but I want to make the conscience choice to do more than just wait. It is not mind-blowing advice to suggest that we should choose a different activity instead of waiting, but that is indeed what I plan to do. Waiting is inactive, living is active, and Lord knows I don’t like to sit still. So my questions for the week are: What are you waiting for? and how can you live instead?